The Portable Baptistry Drain Pump provides safe and convenient draining of the Portable Baptistry, as well as dependable heater circulation when used with the Portable Baptistry Electric Heater. With your garden hose attached, just drop the Drain Pump in the water, plug it in and your Portable Baptistry drains automatically; draining the full-size Portable Baptistry in approx. 1 hour, and the Portable Baptistry Jr. in approx. 25 minutes. 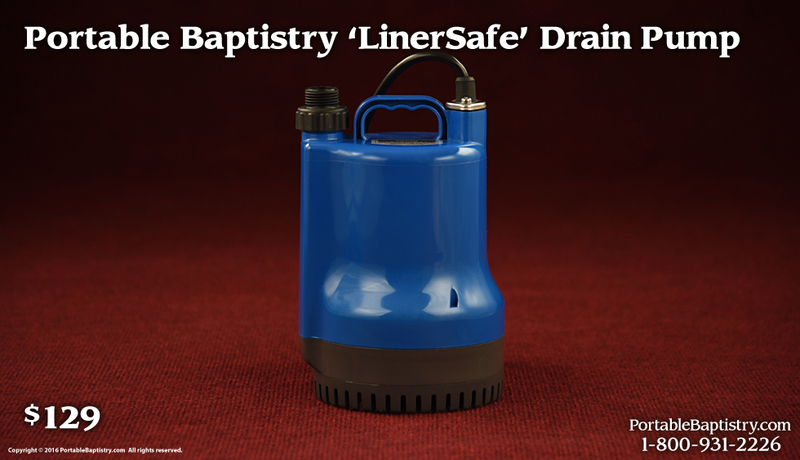 IMPORTANT: The Portable Baptistry Drain Pump is 'LinerSafe', specifically approved by PortableBaptistry.com for safe use with Portable Baptistry Liners and Portable Baptistry Splash Pads. CAUTION: Other brands of drain pumps have been found to put damaging holes in Portable Baptistry Liners, and thus are not recommended for use with the Portable Baptistry.